Help Muiri get her revenge. Travel to Raldbthar and kill Alain Dufont. Return to Muiri for your reward. After completing at least one of Nazir's contracts, returning to the Sanctuary will trigger a scene where a seemingly annoyed Astrid reluctantly welcomes Cicero to the hideout. As Nazir will deny you any rewards before you speak to Astrid, let the conversation finish and then wait for her to approach you. She will hand you the first real job for the Brotherhood: Markarth resident Muiri wants an ex-lover killed. Astrid asks you to show professionalism and explains that you can keep the entire reward, as this is your first contract. In Markarth, Muiri will be at work in The Hag's Cure during the day and hanging out in the Silver Blood Inn in the evening. Approach her and witness her surprise that the Dark Brotherhood actually still exists and that the Sacrament worked. She then explains the story of how she was once a very close friend of the Shatter-Shield family in Windhelm until she met womanizer Alain Dufont. Alain managed to seduce her but, as it turned out, used her to get close to the Shatter-Shield family and rob them blind. The love affair ended with Muiri being kicked out in the cold by the family and Dufont abandoning her, eventually rejoining his bandit colleagues inside Raldbthar. Muiri understandably wants Alain dead, but will make a second request once you arrive, promising to raise the reward if carried out. Muiri wants Nilsine Shatter-Shield assassinated as well, as an act of revenge on the family. Recently the Shatter-Shield family lost youngest daughter Friga to a serial killer and their mourning process was part of Dufont's plan and the very reason he seduced Muiri. The family held Muiri responsible and refused to talk to her ever again. Muiri now reasons they may see just how wrong it was to kick her out if their only remaining daughter dies. You automatically accept the task, but it is optional. Asking her for elaboration will net you two samples of poisonous lotus extract, which may come in handy. Note: If you have yet to trigger the quest Blood on the Ice, do so before killing Nilsine Shatter-Shield. See this section for details. If there is a dead woman lying near the Windhelm Hall of the Dead, then Blood on the Ice has been triggered. All Windhelm citizens know of the tragedy that recently hit the wealthy Shatter-Shield family and will often talk about the serial killer's first victim, Friga Shatter-Shield. When speaking to the grieving parents, Tova and Torbjorn, both will express great sadness, especially Tova. Unaware that Muiri plans her revenge, the family, including your target Nilsine Shatter-Shield, tries to move on in life. 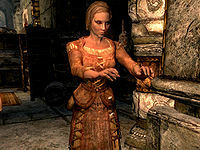 Nilsine can be found roaming around town all day long: browsing the market in the morning, standing near her sister's now-abandoned house, Hjerim, in the afternoon, and spending her evenings inside the Hall of the Dead on weekdays and in the Temple of Talos on weekends. It is not possible to trigger her anger during conversation, so a stealthy kill when she is alone in the evening is preferable. When the deed is done, move on to the real target, Alain Dufont, or return to Muiri in Markarth. Killing Nilsine will cause her already bereaved mother, Tova, to commit suicide in their clan home in Windhelm. Raldbthar is a Dwemer ruin located on the snowy mountainside east of Korvanjund, past Shearpoint. It is one of the three entrances to Blackreach. The target, however, has taken up residence in the first zone, so the trek will not be long. A few bandit enemies patrol near the entrance, so dispose of them, enter the ruin, and fight another bandit inside. Near the first intersection, the inhabitants have been creative with one of the ancient fire traps and a charred skeever will slowly cook when it activates. The path straight ahead is hindered by said fire trap and a leveled lock. For a better chance of a surprise attack, take the eastern tunnel and kill a few bandits along the way. Down the last set of stairs is where Alain Dufont resides, so consider entering sneak mode as you descend. There's a group of three bandits in the chamber and a fourth bandit hidden behind the southern gate. There is an oil slick on the ground that you may take advantage of by using a fire spell to roast the opposition, the unarmored Alain included. Fighting them normally is also an option, but beware of Alain's weapon of choice, the unique and enchanted warhammer Aegisbane. When Alain is dead, the quest will update. Return to Muiri or, if you have yet to kill Nilsine, head to Windhelm. When you return to Muiri in Markarth, she will show no remorse whatsoever and will hand you a leveled amount of gold for taking care of her ex-lover. If you chose to kill Nilsine Shatter-Shield, you will receive a special bonus, the unique Muiri's Ring which will help considerably when creating potions. Completing the optional objective will also allow you to marry Muiri. Back in the Sanctuary, Astrid will thank you for a job well done and will proceed to show greater paranoia concerning Cicero and his insanity. She will finish the quest by asking you to do her a favor, starting the next quest Whispers in the Dark. In the room with Alain Dufont and the two bandits, there are two Dwemer ballistae on the ledge above. The one on the right is aimed at Alain, while the one on the left is aimed at the bandits. If you have already killed Alain, when you talk to Muiri she will give you the gold and say thank you. Talking to her again won't bring up any dialogue so you cannot get the optional quest to kill Nilsine. Additionally, it is possible that Nilsine is already dead as part of the quest Blood on the Ice. After receiving the initial quest from Astrid, use the console command setstage DB03 30 to add the objective to kill Nilsine and setstage DB03 40 to add the objective to return to Muiri with news of Alain's death. Return to Muiri and she should give you your correct reward. As soon as the quest is initiated, you can talk to Nilsine and tell her you have been sent by Muiri, even though that is not yet the case. It is possible that, after the first set of contracts, Cicero never shows up at the Falkreath Sanctuary, so no further quests will be available. This can be fixed by using the console command Setstage to complete all the stages of Mourning Never Comes and to start Whispers in the Dark until asked to eavesdrop on Cicero. If Alain Dufont has been killed prior to starting this quest he can be resurrected by the console commands prid 000d2aff and resurrect. Entering the Falkreath Sanctuary afterwards should trigger Cicero's arrival. Rarely, Nilsine will be teleported to the body cleanup cell even if you never kill her. In such case Muiri will reward you her ring as if you did kill Nilsine. After the quest Tova will commit suicide and Torbjorn will mention their deaths. 10 Astrid has given me my first major contract. I am to contact Muiri, the apothecary's assistant in The Hag's Cure, in Markarth. Muiri has apparently performed the Black Sacrament, and is trying to contact the Dark Brotherhood. 20 Muiri wants me to kill the bandit leader Alain Dufont, who is holed up with his gang of cutthroats in the dwarven ruin of Raldbthar. If Dufont dies, the contract will be completed, but Muiri will pay me some kind of bonus if I also eliminate Nilsine Shatter-Shield, in Windhelm. 40 Alain Dufont is dead. I must now return to Markarth, and tell Muiri the deed is complete. 50 I have spoken to Muiri, and been paid for the assassination of Alain Dufont. I must now report back to Astrid at the Dark Brotherhood Sanctuary. 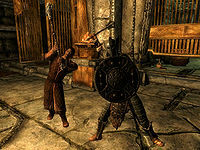 200 Finishes quest After contacting Muiri, the apothecary's assistant at the Hag's Cure in Markarth, I learned that she wished to hire the Dark Brotherhood to kill a slanderous ex-lover. I killed the man, the bandit leader Alain Dufont, and was rewarded for the contract. The following empty quest stages were omitted from the table: 0, 25, 31, 35, 255. On the PC, it is possible to use the console to advance through the quest by entering setstage DB03 stage, where stage is the number of the stage you wish to complete. It is not possible to un-complete (i.e. go back) quest stages, but it is possible to clear all stages of the quest using resetquest DB03. This page was last modified on 29 September 2018, at 21:49.